The original "Creating Lasting Family Connections®" Program Package (includes all 6 training manuals, a set of 150 participant notebooks (25 for each module), 6 trainings, and 6 poster sets). The original Creating Lasting Family Connections® is a program designed for parents and youth which offers training modules for both audiences. The program is designed to: improve communication and conflict resolution skills; build coping mechanisms to resist negative social influences; practice effective refusal skills for both parents and youth; engender self-knowledge, personal responsibility, and respect for others; and impart knowledge and understanding about the use of tobacco, alcohol and other drugs. The CLFC Fatherhood Program: Family Reintegration package (includes all 3 original adult training manuals, a set of 75 participant notebooks (25 for each original adult module), the optional new ABC 3(D) HIV, Hepatitis and Other Sexually Transmitted Prevention Trainer Manual and 25 ABC 3(D) HIV, Hepatitis and Other Sexually Transmitted Diseases Prevention Notebooks for participants, 1 poster set, CLFC Fatherhood Program: Case Management Services and “Optional” Joint Intervention Meeting (JIM) Guide, CLFC Secrets to Successful Facilitation, CLFC Fatherhood Program: Fidelity Package, CLFC Fatherhood Program: Survey Kit for Outcome Evaluation, CLFC Fatherhood Program: Retrospective Survey Kit and the Creating Lasting Family Connections® Fatherhood Program: Adaptation Guidebook. This "guide" presents trainer notes from the program developer, Ted N. Strader, and CLFC Master Trainer, Christopher Kokoski, on how to tailor implementation of the original CLFC curriculum to specifically serve fathers reintegrating into the family after periods of substance abuse, incarceration, military service or any form of physical or emotional separation). The Creating Lasting Family Connections® Marriage Enhancement Program is designed to improve the quality of life for couples involved in any serious and committed relationship. 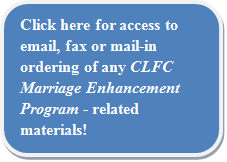 The Marriage Enhancement Program has demonstrated results in specifically enhancing a marriage when one of its members is in recovery for substance abuse, incarcerated or reentering the community after a period of incarceration, military service, or any other form of physical or emotional separation. The Creating Lasting Family Connections® Marriage Enhancement Program helps both partners in a couple to develop a variety of skills married partners find useful in exploring their marriage and establishing or re-establishing a deeper sense of family harmony. Topics include marriage enrichment, respectful and effective communication, refusal and conflict resolution skills, using positive parenting techniques, and encouraging responsible and healthy family-centered attitudes, values and behaviors regarding substance abuse. The Creating Lasting Family Connections Program headlines the Resilient Futures Network product line. "COPES has opened my eyes to a lot of things in my life, the issues, problems, and situations I deal with on a day to day basis. It has given me the proper tools to deal with these issues and situations. I am truly grateful to have had this experience. COPES has helped me better understand myself, relationships, chemical dependency, and much more.". When I first was told of this 10 week program I was sure there was absolutely nothing you all could do or teach me to help my partner and I communicate. I was certain that I would gain absolutely nothing! Ten weeks later my relationship with my partner has gone from feeling so very distant, to now closer than ever. We actually listen to each other and respect how the other person is feeling and that was something we could not do before (someone had to be right and someone had to be wrong!). But most of all, thank you for teaching me that my feelings are REAL! And that I owe it to myself to get in touch with each and every one of them. Thanks for changing my outlook on my self worth. You and your staff have been outstanding. God has given you a very special gift and I thank you for sharing it with me and my partner! " "During the past 20 weeks, while participating in the CLFC Program, I have found this entire program to be extremely informative from start to finish. The program itself is broken down into different modules or sections. In each section different information is presented and as a participant your experience will vary. Each module is very helpful but some modules can be more helpful for different individuals. I found that the module called “Getting Real” was the most helpful for me. Although I have always thought I knew how to say “no”, I have been persuaded to change my answer. This module has taught me how to say “no” and be firm while I respect the other individual’s thoughts and feelings, and in the same sense respecting myself. I would definitely encourage others to participate in this positive experience."